New York (December 12, 2017) – Glamour magazine celebrated its 27th Women of the Year Awards at a gala ceremony at Brooklyn’s landmark Kings Theatre, which was preceded by an all-day Women of the Year Live Summit at the Brooklyn Museum of Art. WorldStage marked its twelfth year working with Overland Entertainment supporting the multi-part event with audio, video and lighting. 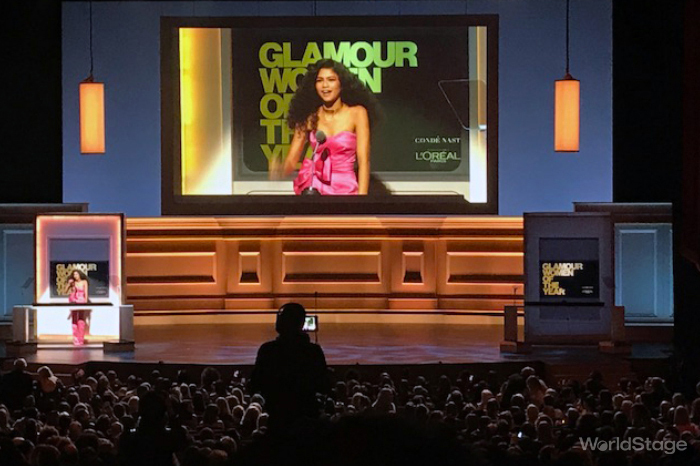 Glamour’s Women of the Year Awards honors game changers, rule breakers and trailblazers, and this year’s gala evening was one of the biggest ever. Recipients of the coveted awards included astronaut Peggy Whitson, actor Nicole Kidman, singer and style star Solange Knowles, late-night host Samantha Bee and Congresswoman Maxine Waters. Kicking off the day was the Summit at the Brooklyn Museum where sessions featured Ashley Graham, Chelsea Clinton, Laverne Cox and many more inspiring women. For the Summit WorldStage supplied equipment and support for sessions in the main auditorium and three breakout rooms plus breakfast and lunch in the Beaux Arts Court. WorldStage outfitted the auditorium with a pair of Christie M Series Digital HD-10K-M video projectors, which provided blended imagery for an 11×20-foot screen. Audio support included Yamaha consoles, d&b sound PA, d&b speakers for the Court, Meyer speakers for the breakout rooms and 26 channels of Shure wireless mics including frequency coordination among the auditorium, Court and breakout rooms. For the awards ceremony WorldStage supplied Kings Theatre with a Panasonic PT-DZ21K-2 21K projector for a 15×26-foot screen set inside a scenic piece built by Cigarbox Studios. Monitors were furnished for the green room, backstage and side stage; a 90-inch Sharp LCD monitor was suspended from the balcony rail for teleprompting. WorldStage also managed signal routing to more than 20 monitors throughout the house. Once again WorldStage’s lighting department partnered with Lighting Designer Alan Adelman on the awards ceremony. “We worked with Alan who created a new design similar to the previous shows at Carnegie Hall that would showcase the amazing new venue – a beautifully ornate theater that was recently renovated,” says WorldStage Lighting Project Manager Derek Abbott. The bulk of the theater lighting package consisted of Vari*Lite VL3500 framing spots, Claypaky Scenius Profiles and A.leda B-EYE K20 LED washes plus a full complement of ETC Series 2 Lustr and Chroma-Q Color Force fixtures. Color Kinetics iColor Cove LEDs were built into scenic pieces surrounding the projection screen. “Alan Adelman set a different look for each of the high-profile guests and presenters,” notes Muller. In addition, WorldStage lit the outdoor step-and-repeat area with four-foot, 4-Bank Kino Flos and provided accent lighting with outdoor-rated Chauvet COLORado 1 Solo LED PARs. At Overland Entertainment Leane Romeo is President and Bruce Patron Vice President.